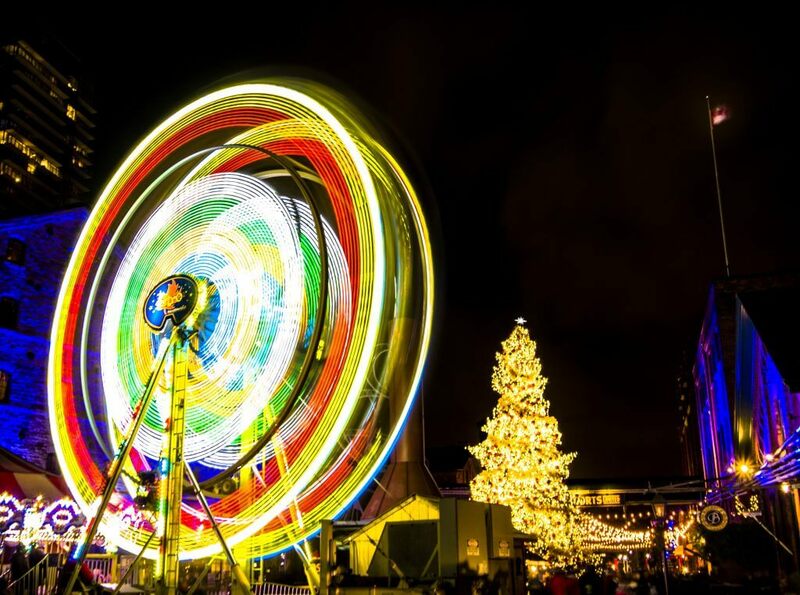 The 2018 Christmas Market is coming and there’s so much to do! 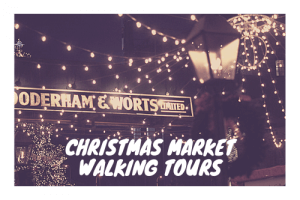 Explore the 2018 Toronto Christmas Market on foot with a Go Tours Canada Walking Tour. 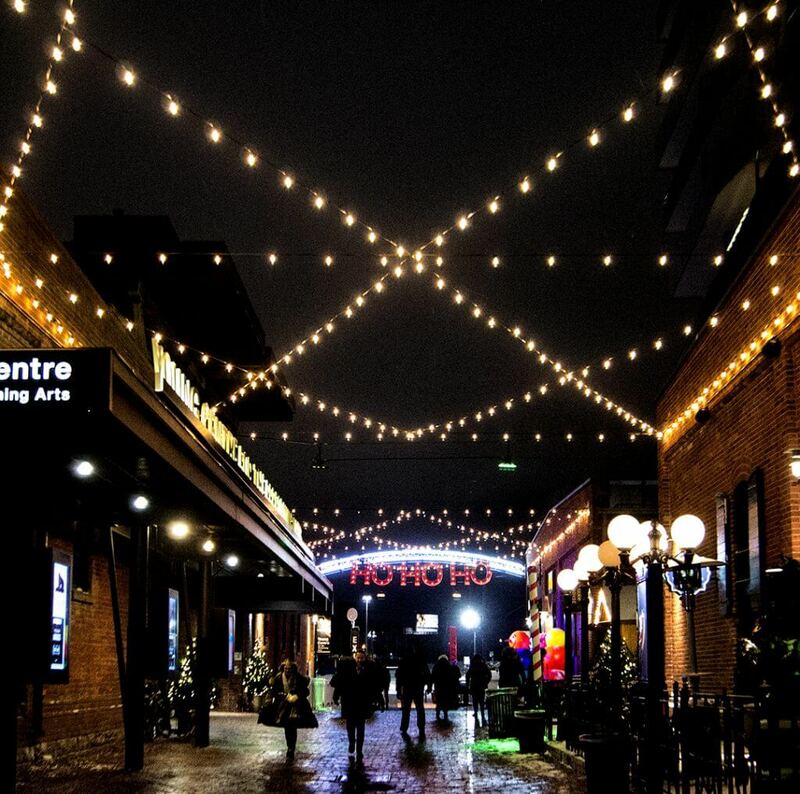 We’ll show you the best photo spots while telling you the incredible story of the Distillery District. Great for dates, families and small groups, our Classic Walking Tour is the perfect introduction to the Distillery whether it’s your 1st or 50th time visiting. 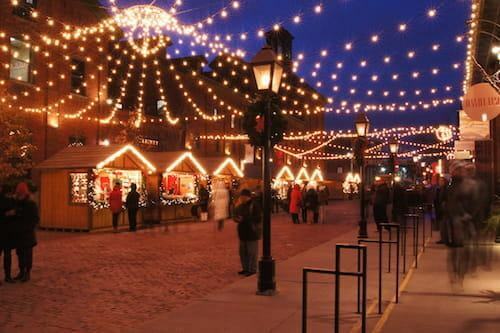 If you’re visiting on a weekend, skip the line AND get free admission to the Christmas Market. Consider it Go Tours’ gift to you for joining one of our award-winning tours. A hot chocolate voucher exclusive to our Christmas Market edition! Book your tour now by clicking here. Please note our tour sizes are limited, book early to ensure your group is able to join us. If you’re booking for a corporate group, please contact us here. 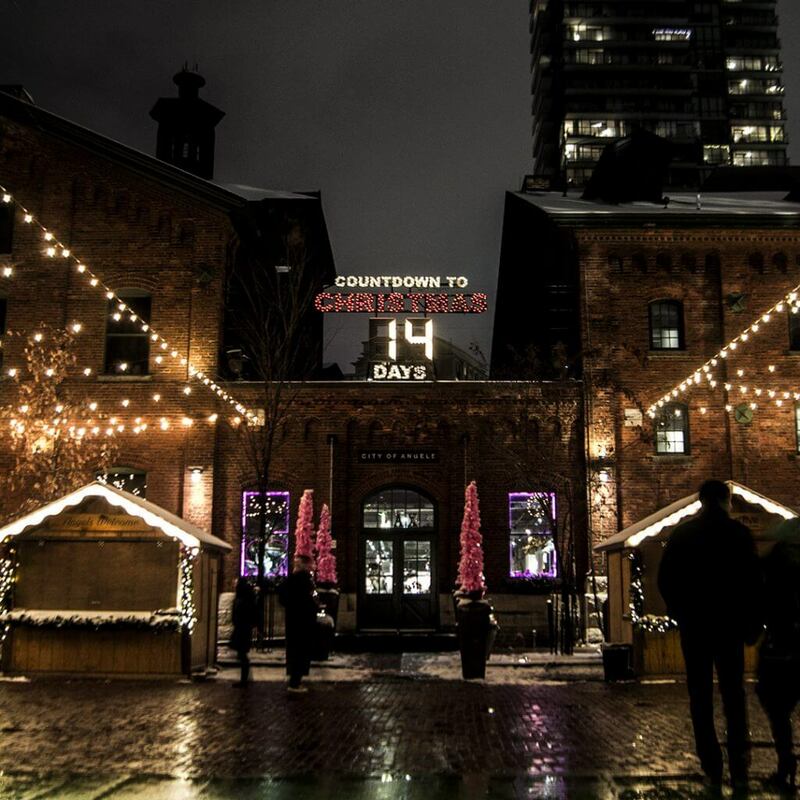 The 2017 Toronto Christmas Market in the Distillery District is a favourite for dates, families and corporate groups! Since year 1, Go Tours has offered an inside glimpse into the neighbourhood and today we’re showing you some of our top 2017 Christmas Market photos. Trinity and Mill is considered the main entrance to the Distillery District and the guard hut has become a mainstay in photos of the area. To the right is the old malting and kiln houses where grain was processed before the whisky-making process. Now inhabited by City of Angels, this space was part of the Cooperage where barrels were built for the whisky aging process. Some of the old wood and metalworking tools used here are still on display throughout the site. 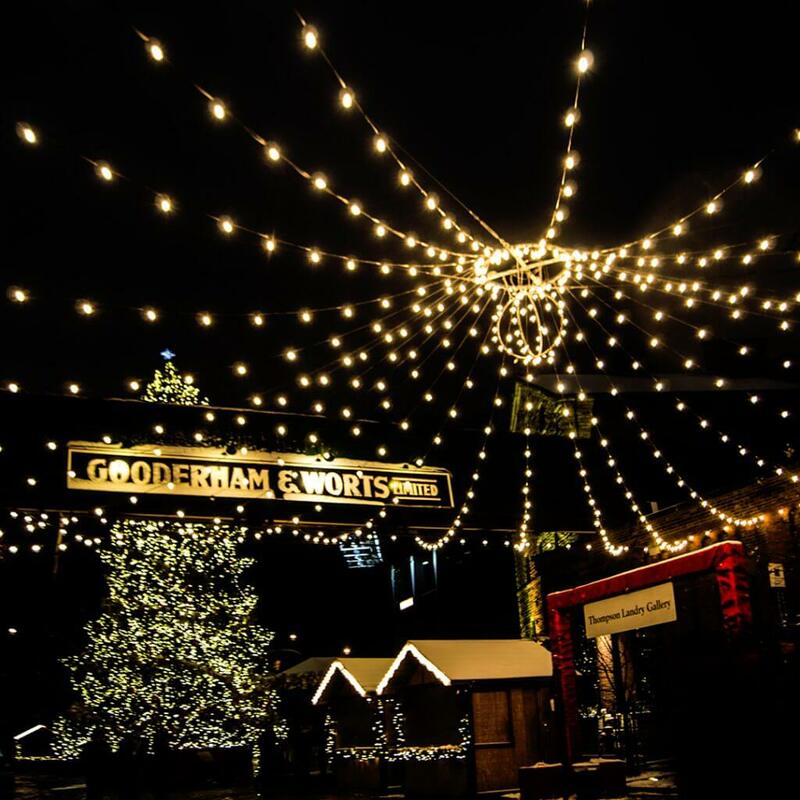 The Gooderham and Worts Distillery during the 2017 Christmas Market. Taken from the intersection of Trinity Street and Tankhouse Lane. The iconic Gooderham and Worts sign is a main feature of the view from this intersection along with a multitude of Victorian Industrial era buildings. The Spirit of York Distillery in Toronto. Captured during the 2017 Toronto Christmas Market. A closer view of the malting house reveals its current tenant, Spirit of York distillery. The second distillery to open in the area (after Mill St. Brewery in 2013) since it shut down as the Gooderham and Worts distillery in 1990, they focus on rye-based alcohols. 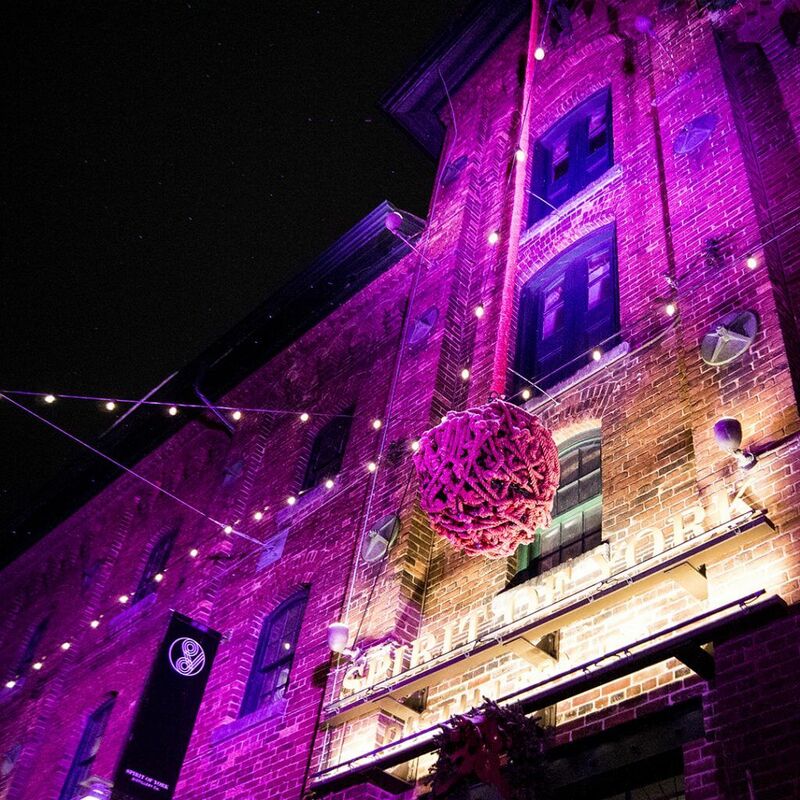 The Young Centre in Toronto’s Distillery District is home to all types of theatre productions. The end of Tankhouse Lane features the Young Centre for the Performing Arts, Gilding the Lily, Cluny Bistro, Yummi Candles and Tankhouse General. The 514 Cherry Streetcar opened in 2016 and is one of the easiest ways to reach the Distillery District from the Yonge St. Subway Line. The 2017 Christmas Market Light Tunnel. 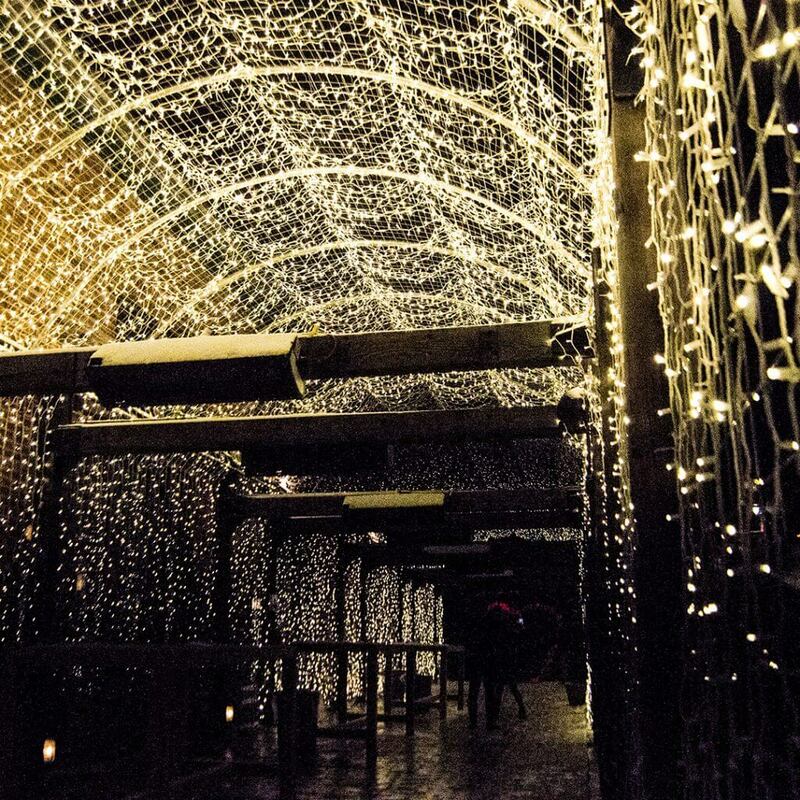 The 2017 Toronto Christmas Market featured a new addition – the light tunnel. This installation likely foreshadows the beginning of the 2018 Light Festival. These are just a few photos of our neighbourhood at night – do you have any to share? Tag us on Instagram and we’ll feature them in a future post! Not a photographer? Take one of our Walking Tours and we’ll learn you some hot history. 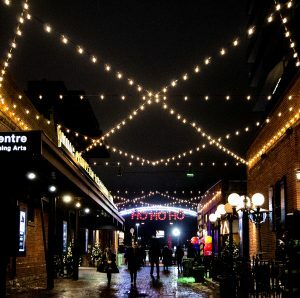 Check out our post of what to do in the Distillery District while you’re here for the Christmas Market. 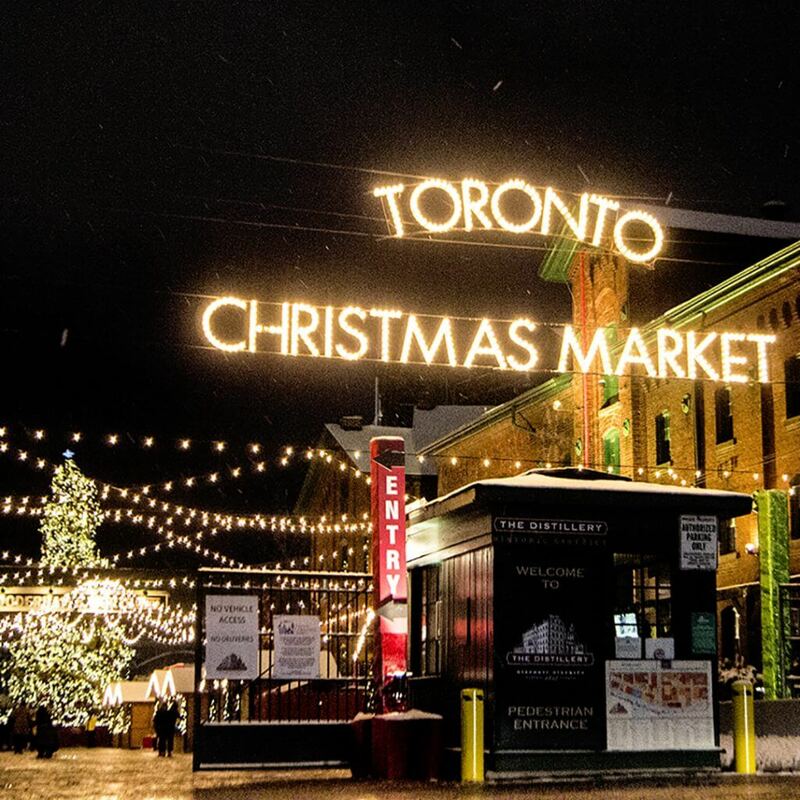 Since 2010 the Toronto Christmas Market has been a staple in Toronto. Over half a million Torontonians and tourists visited the 2016 Market and that number is expected to grow in 2017. As the Distillery District‘s resident tour company, we’ve put together a list of recommendations for your visit. 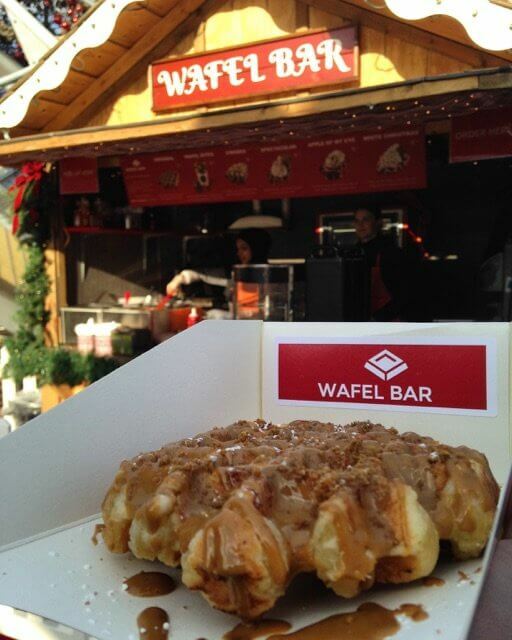 The Wafel Bar is an absolutely delicious way to enjoy the Toronto Christmas Market. The 2017 Toronto Christmas Market features new vendors, a light tunnel and absolutely delicious snacks of all types. Wafel Bar: New for 2017, we’ve teamed up with Wafel Bar. Everyone joining us for a walking tour already receives a hot chocolate voucher and we’ve upped the game with a complimentary mini-Wafel too! Chimney Stax: A classic baked treat served either sweet or savory. Chimney Stax at the Toronto Christmas Market has an incredible selection of styles and you’ll probably end up wanting more than one. Uncle Betty’s: Donuts? Oh yeah. There isn’t really anything else we need to say about this booth except you’re going to love it. Make sure you check them out on your visit to the Christmas Market. The Toronto Christmas Market Ferris Wheel. In recent years the Distillery District has become a hotbed of coffee shops. With 7 coffee shops in 13 acres the area is a caffeine addicts dream. Arvo: If you’re looking for chill vibes, great tunes and an insanely good Americano, check out Arvo Coffee. Their friendly staff are passionate about a perfect pull of espresso and just really cool folks. 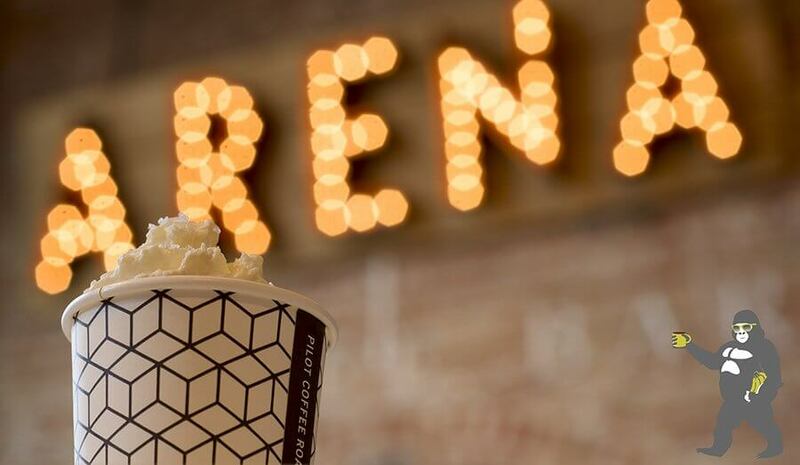 Arena: If you want something flavoured, check out Arena Coffee. Their lineup of hot chocolate and espresso based drinks will excite your nose as much as your mouth. They’re located in Sport Gallery so you can check out really cool sports memorabilia as you sip a tasty drink. Arena Coffee has some of the best flavored drinks in Toronto. We’ll be back next week with a photo post, check it out here! And don’t forget we’re offering our Classic Walking Tours during your visit. Free hot chocolate and mini-Wafel included.